We have tried BOA enclosures on tri shoes and have had some good results, and then some great ones. Both the Scott Tri Carbon and Specialized S-Works Trivents feature a BOA enclosure as their main enclosure system. 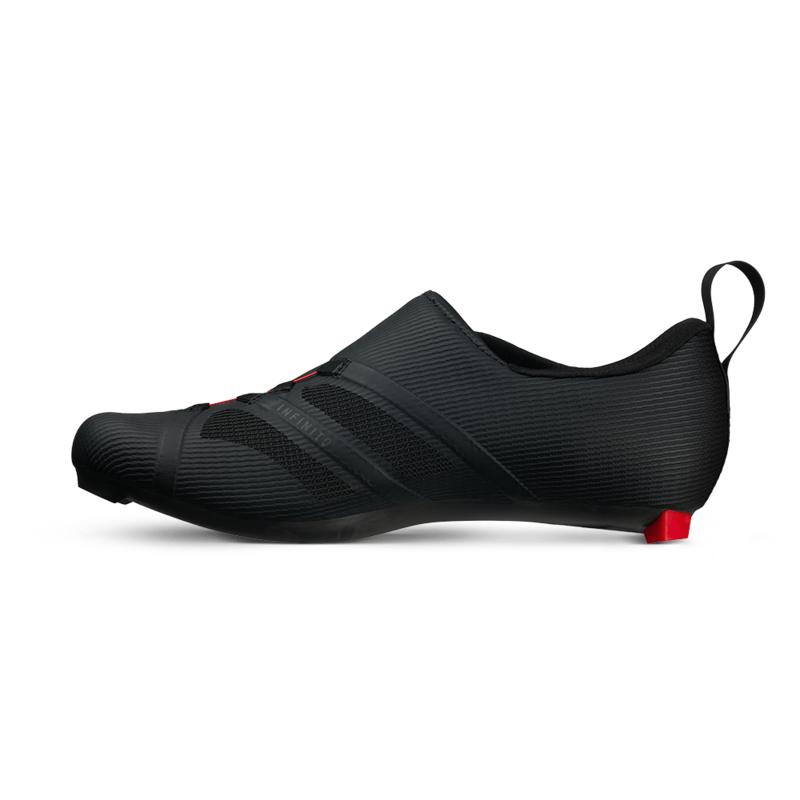 The benefit is micro adjusting of the overall shoe AND a blistering fast unlatching for T2. But the downside is that getting it tightened out of T1 takes more time and effort than a standard velcro strap. 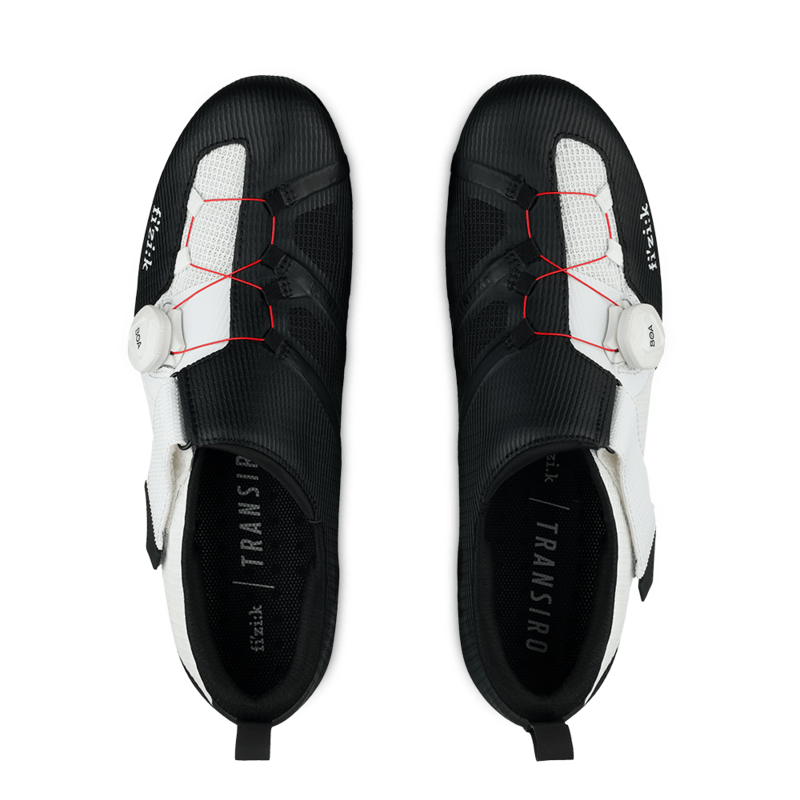 Others like the Louis Garneau Tri-400 use velcro for the main enclosure while BOA is used to allow a differentiated fit adjustment for the instep and forefoot areas. And when BOA is used for that fine tuning we have been rightly impressed. 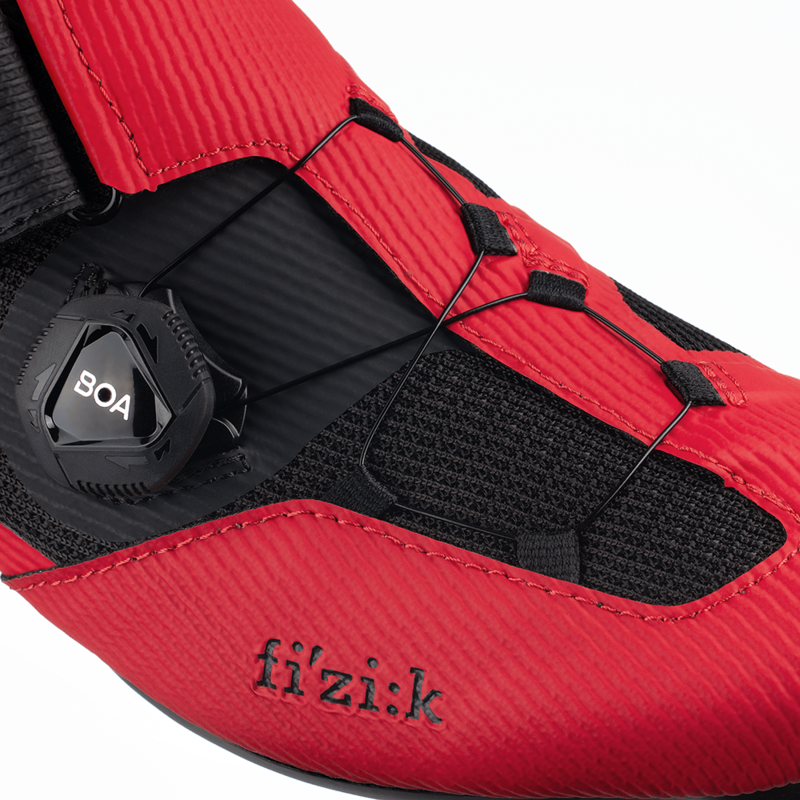 Which makes us excited to see fizik’s new Transior Infinito R3, being that it takes that same BOA concept the Tri-400 successfully uses and packs it into a shoe built upon the latest and greatest from fizik. 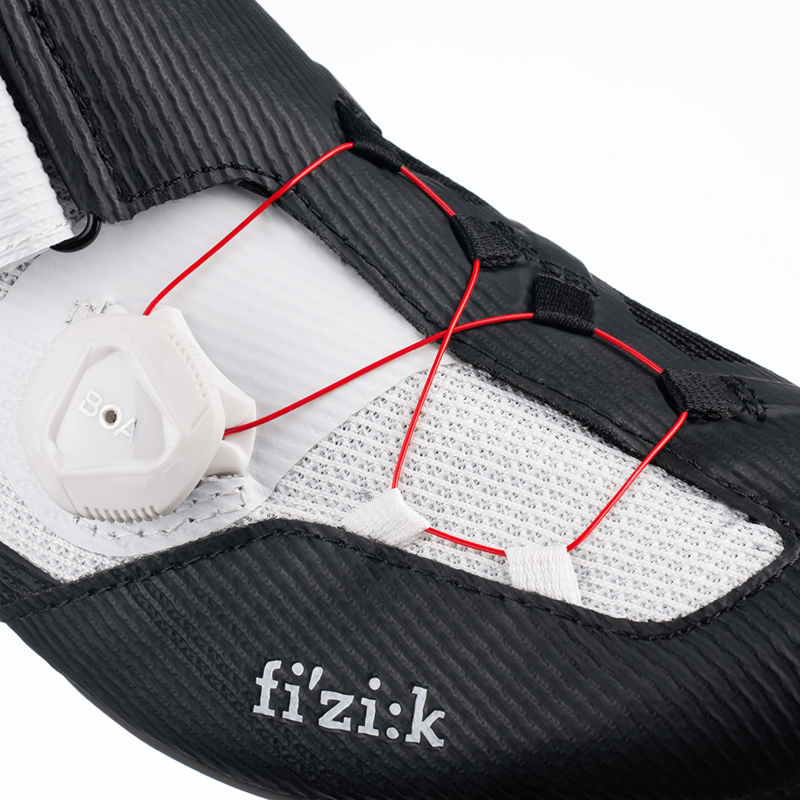 All triathlon shoes are most quickly defined by their enclosure system. The Transiro Infinito R3 combines a Boa dial with a Powerstrap. This provides first a quick, easy and secure closure for speedy, hassle-free T1, then micro-adjustable fine tuning for a precise fit, comfort and efficiency. 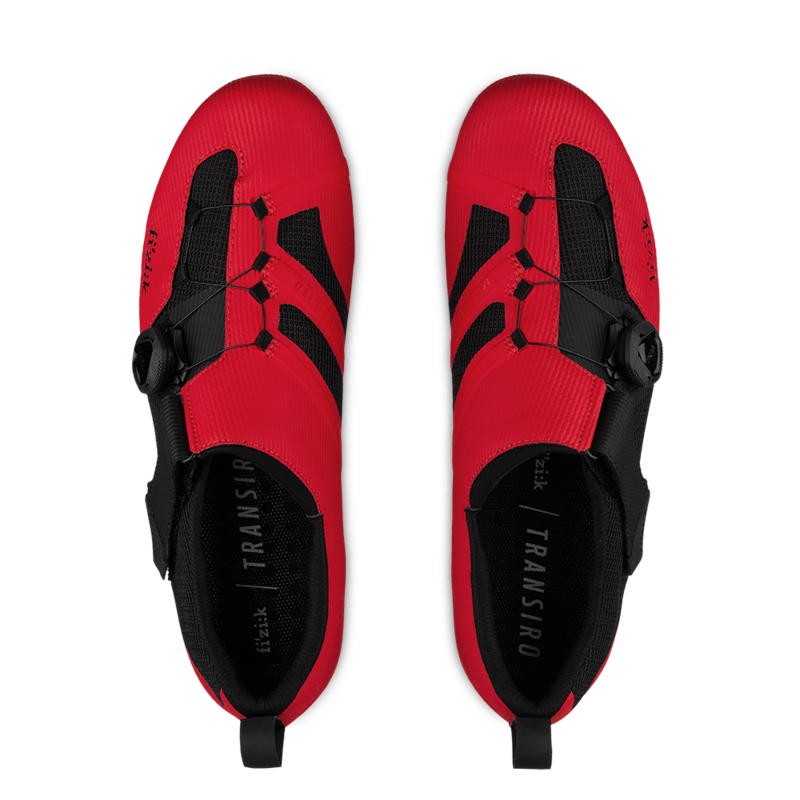 The Volume Control system initially developed for Grand Tour winning road shoes, allows a differentiated fit adjustment for the instep and forefoot areas. The volume of the forefoot area can be regulated using the Infinito adjustment system with its infinite lace loop controlled by the Boa dial. Infinito balances out the tensioning and further eliminates pressure hot spots by using textile webbing in place of plastic lace guides. This closure system acts on a larger area of the shoe’s upper, pulling the eyestays inwards consistently from all directions for a more supportive and comfortable fit. To ease transition, the instep Powerstrap can be locked in the wide open position ready for quick and easy foot entry. Its lower cut neck has a cushioned flat-seam collar for a smooth sockless foot entry and riding comfort. 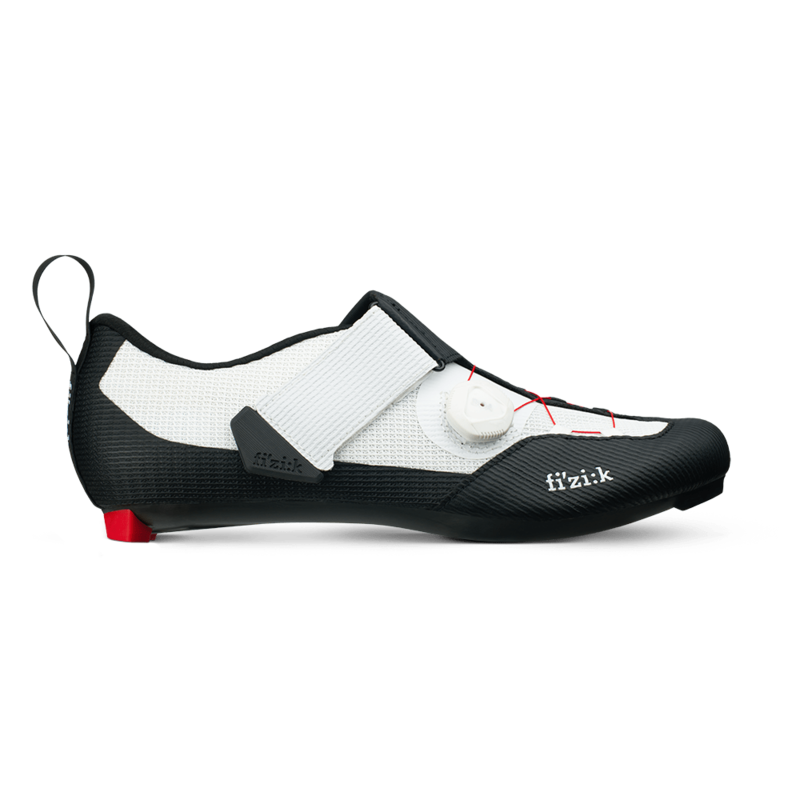 The heel is equipped with a rubberized loop to facilitate setting the shoes ready clipped into the pedals at T1, and to make it as easy as possible for the athlete to quickly pull feet securely into them. The Transiro Infinito R3’s upper is made from a mesh material that’s flexible to ensure a close fit, and is highly breathable, aiding with temperature management on the bike leg. The upper is also effectively supportive, thanks to the PU lamination on targeted areas that works with the sole for power transfer. The stiff R3 unidirectional full carbon outsole ensures that power is efficiently transferred to the pedals, yet remains lightweight, contributing to the overall low figure of 476g. 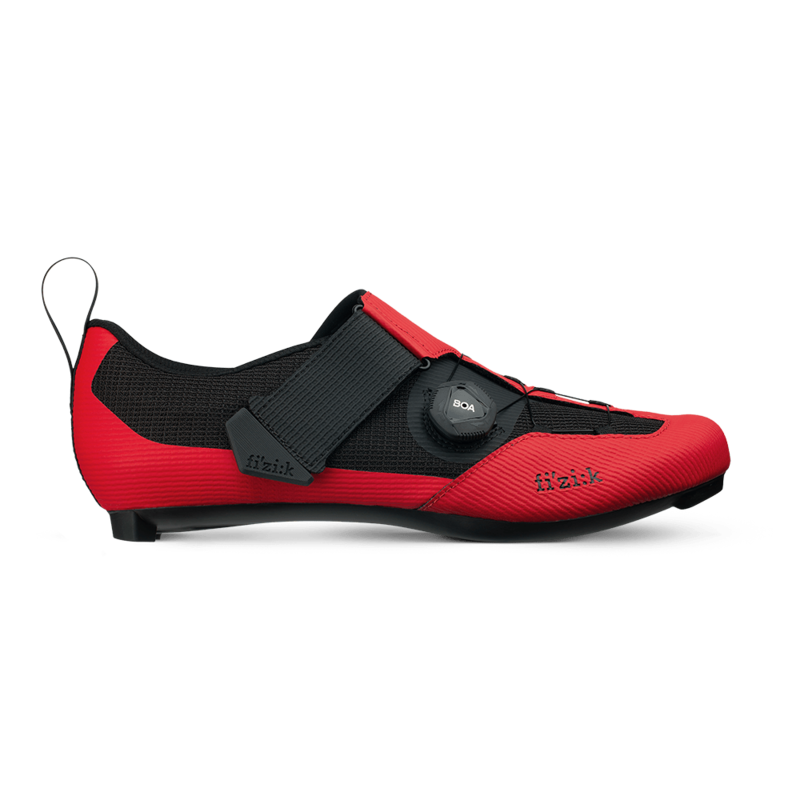 Based on the R3 road shoe, the sole has been modified with extra wide ventilation cutouts, boasting even greater breathability than its road counterpart. The Transiro Infinito R3 is available worldwide now in two colorway options and a full range of sizes 36-48 (37 to 47 also in half sizes). The suggested retail price is €249.00 / $300.00 / £234.99. 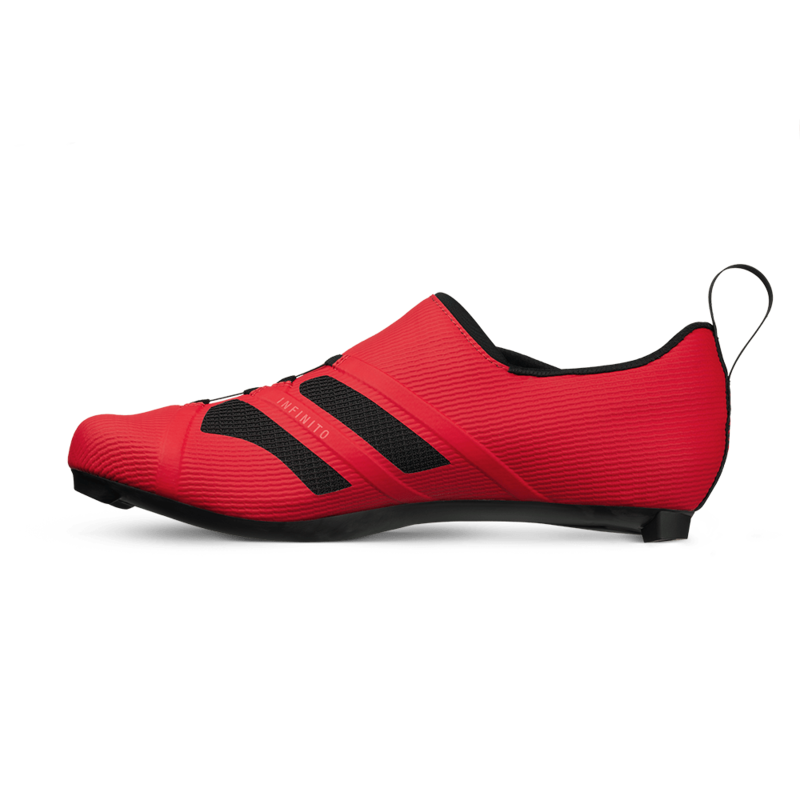 Getting an enclosure system right on a triathlon shoe is incredibly important (and incredibly hard). It has to be quick and easy to close ensuring a distraction free mount out of T1. But secure enough to handle the hundreds of watts of power that it will endure during any moment of a training or race ride. We firmly believe a company is going to nail a BOA main enclosure one of these days (possibly by inventing a self closing variety that solves our T1 issues). But until then the hybrid approach that fizik has adopted here is one of our favorites. You get a quick closing main velcro strap along with a super adjustable instep and forefoot area. 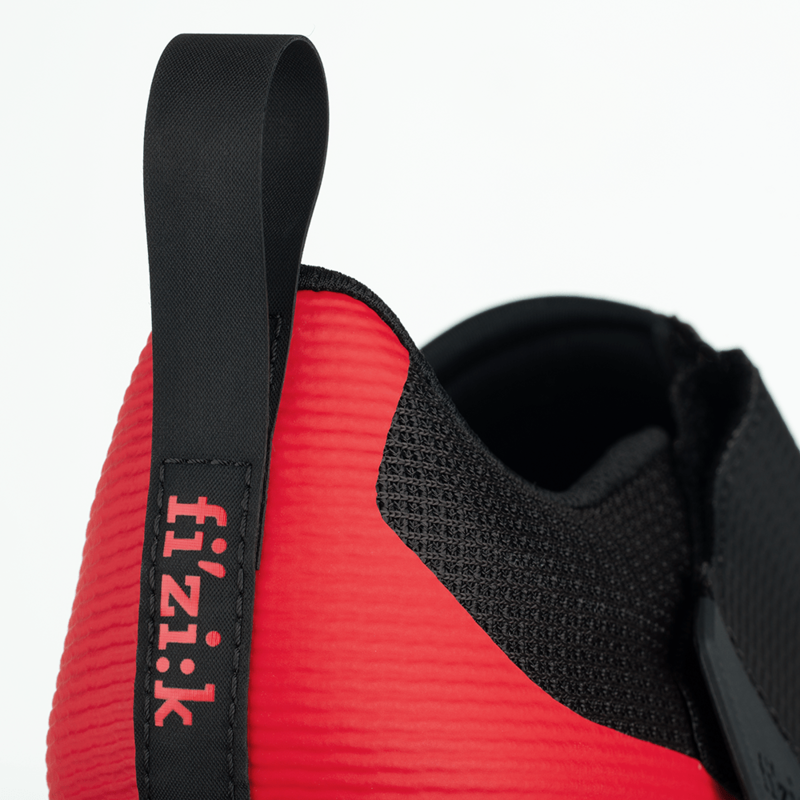 You also get fizik’s R3 unidirectional full carbon outsole which ensures every watt you are pushing down will get to your pedals to crank to rear wheel. 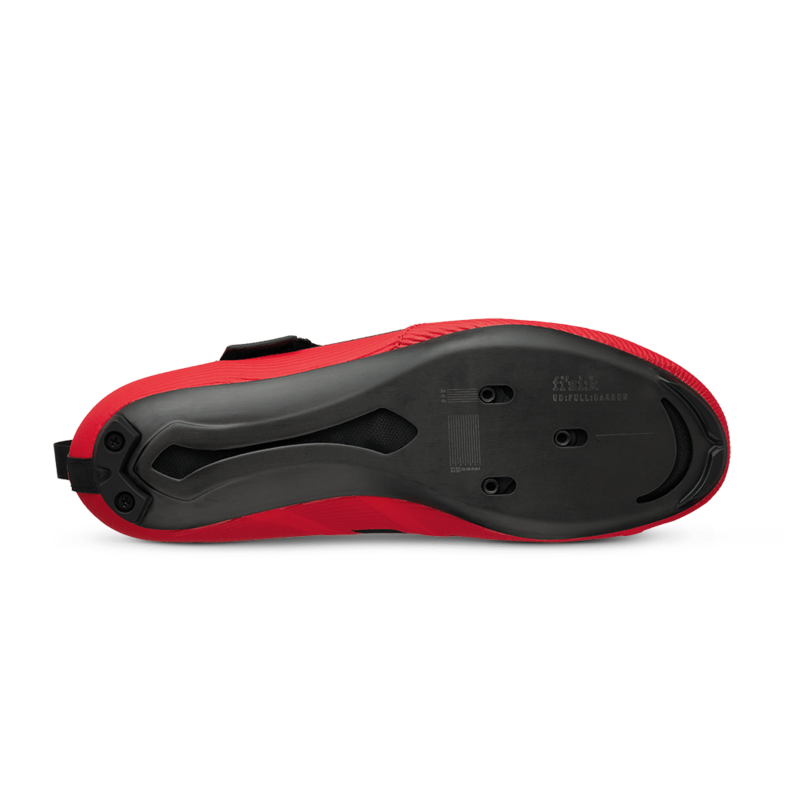 Our previous experience with fizik’s carbon outsoles have been quite impressive – no noticeable bending under the power we could put on them. We look forward to seeing how these stack up. Regarding pricing, at $300 for the Transiro Infinito R3 the price falls somewhere between the Specialized Trivents and Louis Garneau Tri-400s so feels at first glance spot on. Only time (and a full review) will tell if our initial regard for the Transiro Infinito R3 is justly deserved. But the good news is that we are already working on getting a pair for review. Make sure to follow us on Twitter, Facebook, or Instagram to hear when our review pair arrives. And also stay tuned to AeroGeeks.com this week for another exciting announcement sometime this week! I tried these shoes. Great looking shoe! Perfect width. Unfortunately the Boa sits right on top of the junction between the metatarsal and proximal phalange bone of my little toe. Ouch! If they would’ve put it up a little bit further on the matatarsal bone it would be perfect. Bummer.